ASHLAND, OH (11/27/2018)— The following students are members of the Exercise Science Club at Ashland University. The Exercise Science Club is an organization for Exercise Science majors, as well as non-majors interested in the topic. Events include free fitness testing, professional speakers and wally-ball night. Each year, a community service project is selected and completed. The bi-weekly meetings are for events and future event planning. Jerald Gaydos of Sunbury, OH is a member of the Exercise Science Club at Ashland University. Gaydos is majoring in exercise science. Gaydos is a 2015 graduate of Big Walnut High School. Timothy Rumas of Sunbury, OH is a member of the Exercise Science Club at Ashland University. Rumas is majoring in exercise science. Rumas is a 2018 graduate of Big Walnut High School. ASHLAND, OH (11/29/2018)— Mohammed Bawazeer of Galena, OH is a member of the Ashland Commuter Eagles at Ashland University. Bawazeer is majoring in computer science. The Ashland Commuter Eagles is a group of commuter students dedicated to making the lives of commuters easier. They put on such events as commuter breaks, which happen a few times throughout the semester and provide food in the commuter lounge to encourage commuter students to meet and get to know each other better, and bimonthly meetings to touch base with commuter students to ensure that they are satisfied with their commuting experience. Ashland Commuter Eagles is the voice through which commuting students are heard. ASHLAND, OH (11/26/2018)— Hayley VonderEmbse of Westerville, OH is a member of the Women’s Chorus at Ashland University. VonderEmbse is majoring in early childhood education. VonderEmbse is a 2018 graduate of Westerville Central High School. The Women’s Chorus, directed by Julie Strebler-Renner, provides women with an opportunity to study and perform choral literature written especially for treble voices and representing a variety of styles, eras, composers and languages. The Chorus performs at a number of campus events, including the Ashland University Festival of Lights. ASHLAND, OH (11/20/2018)— Angelica Frye of Galena, OH, is a member of Ashland University’s Alexander Hamilton Society. Frye is majoring in history. Frye is a 2017 graduate of Olentangy Orange High School. The Alexander Hamilton Society or (AHS) seeks to gather students and prominent members of foreign policy, national security, and international affairs community to foster debate and discussion and create a network of students and professionals to use to their advantages. AHS is an independent, non-partisan, not-for-profit organization dedicated to promoting constructive debate on basic principles and contemporary issues in foreign, economic, and national security policy. ASHLAND, OH (11/26/2018)— Megan Davis of Centerburg, OH is a member of Alpha Phi at Ashland University. Davis is majoring in nursing. Davis is a 2017 graduate of Centerburg High School. The Epsilon Alpha Chapter of the Alpha Phi sorority is dedicated to improving and embodying their six core values: character development, scholarship, service, loyalty, leadership, and sisterhood. Alpha Phi prides itself in fundraising for the Alpha Phi Foundation and raising awareness for cardiac care. Their philanthropy programs and events include the Pre Red Dress Social, The Annual Red Dress Gala, Cardiac Care Week, Hoops for Heart, and Mr. University. CONWAY, SC (12/20/2018)— More than 2,400 students at Coastal Carolina University were named to the Dean’s List for the Fall 2018 semester. That’s more than 23 percent of the student body earning a GPA of 3.5 or higher. Madison Magnus, a Psychology major from Westerville, OH, 43081. Coastal Carolina University offers baccalaureate degrees in 73 major fields of study. Among CCU’s 25 graduate-level programs are 21 master’s degrees, two educational specialist degrees, and the Ph.D. in education and marine science: coastal and marine systems science. The most popular undergraduate majors are marine science, management, exercise and sport science, communication and psychology. CCU boasts a growing array of internship, research and international opportunities for students, as well as numerous online programs through Coastal Online. McDaniel College Student Jeffery Clark of Westerville Participated in the Model European Union in Washington, D.C.
WESTMINSTER, MD (12/03/2018)— Jeffery Clark of Westerville (43082), a student at McDaniel College, Westminster, Md., participated in the Model European Union 2018 Conference in Washington, D.C., November 9-11. McDaniel’s delegation of 10 students represented Belgium and had a briefing at the Embassy of Belgium by the actual diplomats who represent the country. Christianna N. Leahy, chair of the political science and international studies department at McDaniel, accompanied the students. The Mid-Atlantic European Union Simulation engages students in discussions and debates that are both current and topical on the European Union (EU)’s agenda. Over 100 students from colleges and universities throughout the mid-Atlantic region participate in the simulation. Visit eu-simulation.org for more information. COLUMBUS — The Ohio State University has selected two graduating seniors as recipients of the President’s Prize, the highest university recognition bestowed on exceptional students committed to social change. COLUMBUS, Ohio —Three faculty members in psychology are among five Ohio State University researchers elected this year as Fellows of the American Association for the Advancement of Science (AAAS). Fellows are selected by their academic peers. It is considered one of the most prestigious honors given to U.S. scientists. New fellows will be honored at a ceremony at the annual AAAS meeting in Washington, D.C. in February. With the addition of these new honorees, Ohio State boasts more than 100 AAAS Fellows. 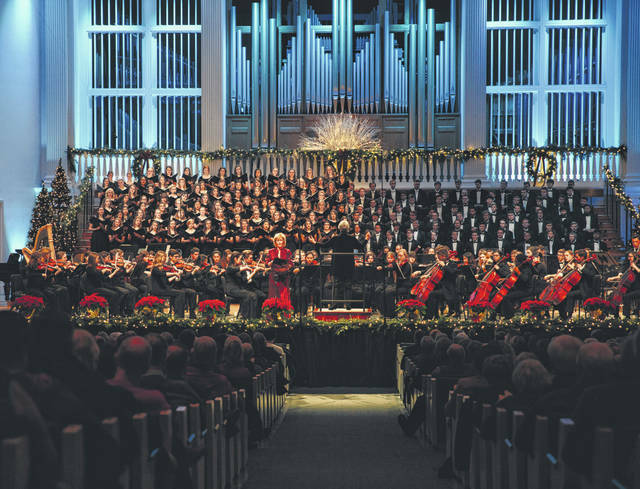 WHEATON, IL (12/20/2018)— Wheaton College student Jared Hackworth performed in “Blessed Son of God,” the 2018 Christmas Festival presented by the Wheaton College Conservatory of Music. Hackworth, of Sunbury, Ohio, sang tenor II in the Men’s Glee Club. YOUNGSTOWN, OH (11/27/2018)— Ashley Walden, a Exercise Science major from Westerville, represented YSU at the 46th Annual Meeting of the Midwest Chapter of the American College of Sports Medicine in Grand Rapids, Mich. The MWACSM is one of 12 regional chapters within the ACSM ( www.acsm.org ) – the largest sports medicine and exercise science organization in the world. With more than 50,000 members and certified professionals worldwide, ACSM is dedicated to advancing and integrating scientific research to provide educational and practical applications of exercise science and sports medicine.